A 1920s Rolls-Royce promotional lorry. Homepage. This page: A promotional vehicle owned by Notwen Oils from the 1930s, based on an earlier Rolls-Royce car chassis. It shouldn't happen to a Rolls-Royce. Shown above is a promotional card issued by Notwen Oils during the 1930s. Although it is in poor condition, the subject of the photo makes it worth including here. The vehicle shown is a Rolls-Royce, quite possibly a Silver Ghost chassis and front end, onto which a coachbuilt promotional body has been fitted. The cab definitely looks like a one-off, and is signwritten with various Notwen logos. To the rear are various compartment into which an assortment of Notwen Oil tins are stored, and displayed to the passing public. Perhaps this was built purely as a promotional vehicle? or was it really used as a delivery lorry, to deliver oil to local motor factors and garages? It wasn't unknown for early Rolls-Royce chassis to be used in this way. During the First World War, many Rolls-Royces were fitted with bodies to be used by the Army or Ambulance services, some Silver Ghost chassis were even converted into fighting vehicles, sprouting armoured bodywork, rotating turret and light armaments, many being used in the Middle East. If anyone can shed any more light on the Notwen Rolls-Royce, please get in touch. 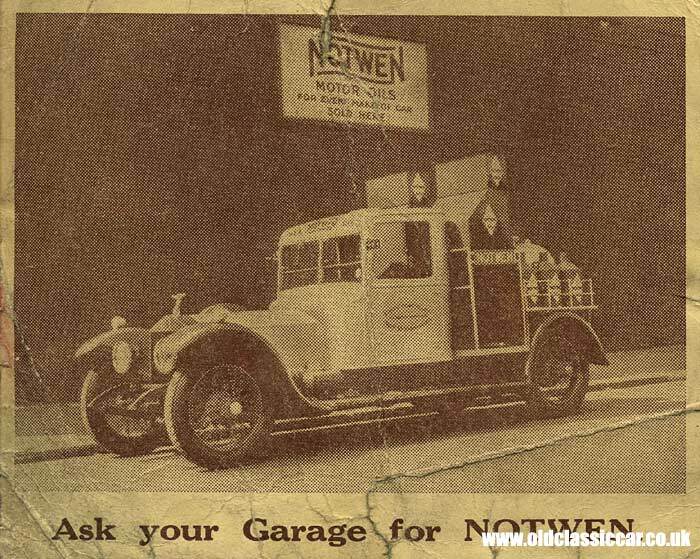 Notwen Oils was one of the key sponsors of the chap who ran my Dodge lorry in the 40s, some of their period advertisements can be seen on this page. A screensaver featuring a number of vintage and classic Rolls-Royces (no trucks though!) can be found here. If you are restoring a R-R motor car, the free R-R parts ads section may also be of use.